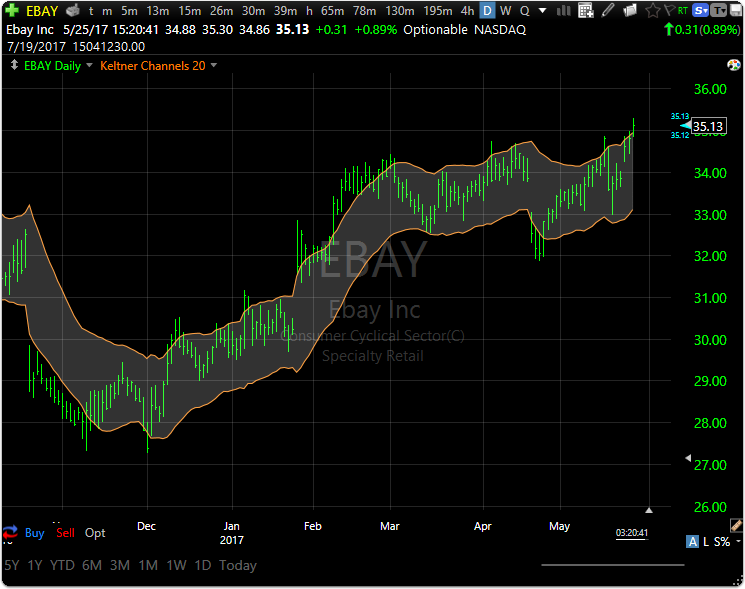 Channels drawn around a moving average of typical price (High + Low + Close) / 3. A moving average (10 or 20-period) of the typical price [(High + Low + Close)/3] is used to construct the midline (not displayed on chart). Then the average true range is calculated over a time period (same as midline, 10 or 20-period) and multiplied by a multiple (usually 1.5); the calculated number is then added to the midline to form the upper Keltner Channel and subtracted from the midline to form the lower Keltner Channel. A close above the upper channel is considered bullish and a close below the lower channel is considered bearish. Where x is the period and must be an integer. Where w is the ATR Multiplier which must be a number. Where z is the offset. An offset of 1 is for 1 bar ago. Where t is the Average Type. Leave blank for Simple, X for Exponential, F for Front Weighted, and H for Hull. The top exponential Keltner Channel 20, 1.50 for the current bar can be written as follows. But you can leave off the offset parameters since it is for the current bar. The bottom Keltner Channel just changes the + between the / 3 and 1.5 * into a - instead. And the center line dispenses with adding or subtracting a multiple of the Average True Range. 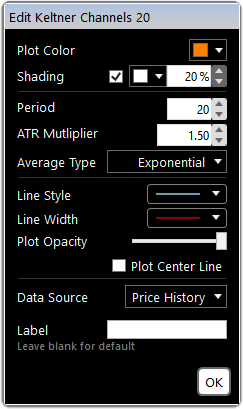 Since the ATR Multiplier is both added and subtracted from this center line, the width needs to use double the ATR Multiplier used in the formulas for the top and bottom channels. Which could then be simplified.